My research objective is to gain a better understanding of earth surface processes and landscape evolution, focussing on mountainous regions and glaciers. My approach is multi-disciplinary, primarily combining fieldwork, laboratory work and numerical modelling. The need to quantify past conditions on Earth has led to the development of various innovative techniques, and I am particularly interested in the field of luminescence dating. Luminescence dating holds the potential to reconstruct past ice extents and erosion rates. The main advantage of this method lies in its ability to provide information on Earth’s history over Quaternary timescales at a catchment scale, whilst maintaining reasonable preparation time and costs. Our ability to quantify past climate conditions and ice extents may aid in future predictions of climate scenarios and the associated landscape evolution. My PhD project will constrain paleo-ice extents and erosion rates of the Gorner glacier, Zermatt, Switzerland, since the Last Glacial Maximum. The idea is to use Optically Stimulated Luminescence (OSL) surface bedrock exposure dating combined with cosmogenic nuclide dating. The basic principle of OSL surface bedrock exposure relies on the formation of a bleaching front at the surface of rocks, which were once covered by ice and protected from sunlight but have since been exposed with the thinning of the glacier. Previous work in this field has shown a correlation between the depth of this bleaching front and exposure time to sunlight, and I aim to link this signal to the glacier thinning rates to provide insight into past ice extents and erosion rates. In June 2016, I was awarded a BSc and an MSci in Geology from the Department of Earth Science and Engineering at Imperial College London. My MSci project titled “Assessing the paleoseismology of the Hat Creek Fault, north-eastern California, using cosmogenic 3He dating” involved a combination of fieldwork, laboratory work and numerical analysis which fuelled my desire to work on projects that also incorporate a variety of disciplines. 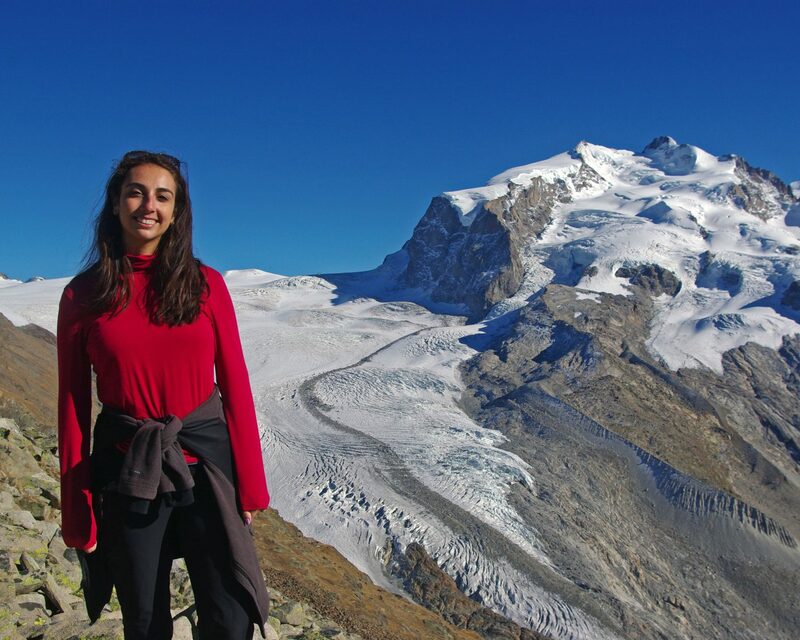 Having always been captivated by mountainous environments and glaciers, I decided to partner my previous expertise with these interests and joined the Institute of Earth Surface Dynamics in September 2017 to begin my PhD.